It's Lou in with a post for you today. 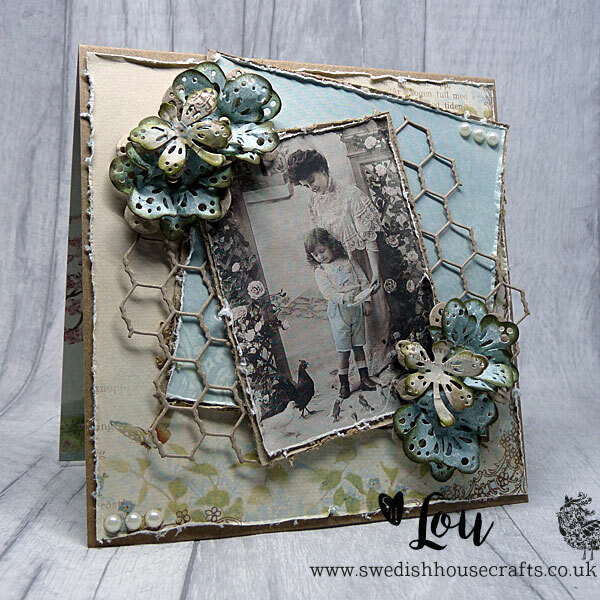 I was in a fairly CAS cardmaking kind of mood for this one so just a few simple layers and one of the gorgeous images from the Pion Designs- From Grandma's Attic- Mothers day sheet was all I needed on my little craft desk to get me going. I also dusted off one of my older Pion 12x12 papers, (Fairytales of spring and My Dearest Sofia - lovely things), because they looked so lovely with the little image. I trimmed all my mat pieces and then distressed the edges of each piece with the edge of my scissors blade. 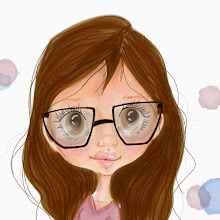 This photo is from an older make I have posted but just in case anyone is new to our blog I thought I'd show how I do that. 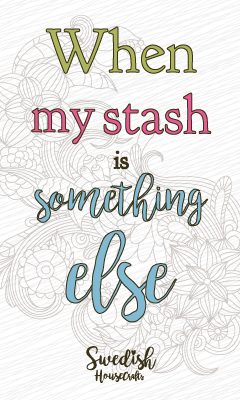 I couldn't resist die cutting a few things too though! 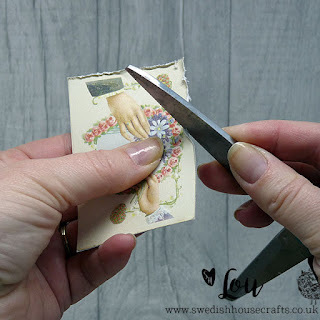 I cut myself 4 of the smallest dragonflies dies in the Magnolia stamps- Bon Voyage- Dragonflies Doo Hickey dies set, 2 in kraft card and 2 in the patterned paper scraps left from my card base. I carefully dry embossed them with my ball tool on a foam mat to give them some 'pop' before gluing the 2 layers together. I love how they come out when you do that. I also cut some of the smallest Bon Voyage flowers Doo Hickey die out in kraft and the scraps too. I cut four in kraft and eight in the scraps. Then I screwed up the flowers and carefully unscrewed them to get some dimension into them before I popped them all together with a mini brad and inked the edges. I really love the effect doing that gives to them. Before I adhered my image piece onto the card I thought that the Gummiapan Hens Net die would tie in so sweetly with the little hen's the boy is feeding in the image so I used some kraft card to die cut it, then cut in half and glued it to the back of my image piece. Then very carefully, I hot glued my little dragonflies onto the flowers. 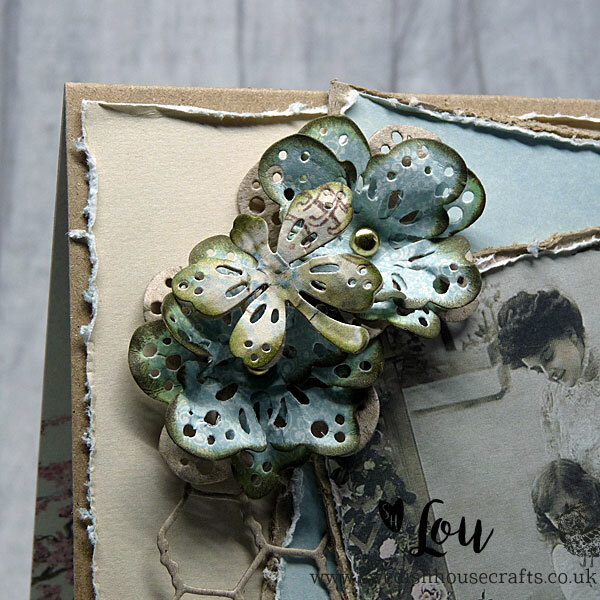 They look so pretty like that and it really makes a beautiful focal point on a simple card making. Here is the bottom corner from a slightly different angle. 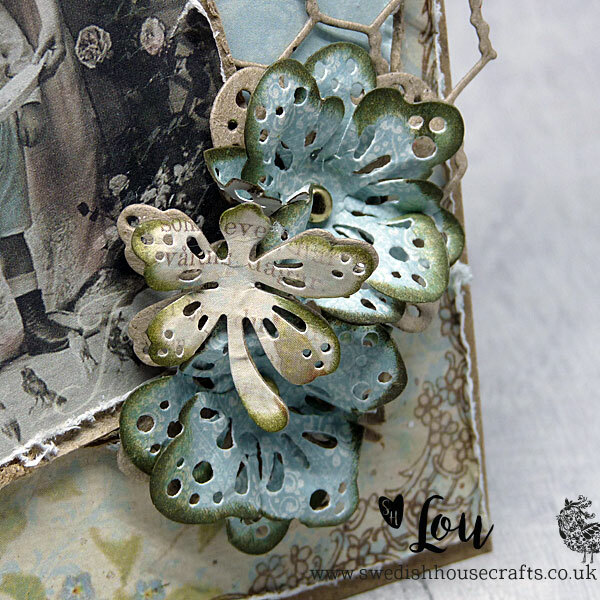 Pion Designs- From Grandma's Attic- Mothers day. Magnolia stamps- Bon Voyage- Dragonflies Doo Hickey dies.